The National Geographic Society reported today that the bones of Joan of Arc is really an Egyptian Mummy. 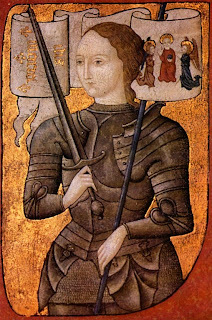 Joan of Arc was the most famous person in Europe at the time she died in 1431. She had taken charge of the French Army and had turned the 100 Years War around. Even though she was burned at the stake, her remains must have received high level attention at the time. According to the NG story, they were discovered above a Paris drug store in 1867. How did they disappear to begin with? How did those in authority decide they were genuine in 1867? Between then and now, the burnt bones have resided in a church in Normandy. Scientists exhumed them and studied them. Carbon dating showed that their age went back to the 6th. century BC. Pieces of cloth showed that the bones had been part of a mummy and pine resin on the cloth took the scientists to Egypt. So the mystery deepens. What did happen to Joan’s bones? How did a mummy from Egypt of all places make it to Paris and get confused with her? If this was a hoax, wouldn’t it have been easier to just use some anonymous body from a local cemetery? Joan had been such an amazing person; she had been so courageous; she deserved better. painting circa 1485 from Centre Historique des Archives Nationales, Paris, AE II 2490. Joan of Arc's life is the best documented of any person not from modern times. Anyone who has studied her history knows that any remains have to be bogus. More people should study her true history at places like Joan of Arc - MaidofHeaven.com and they will not fall for such fairytales.